I made a quick decision to simplify matters and make an immediate trip to Venezuela. This solves my expiring visa problem (tomorrow), travelling VE with all my stuff (instead it stays in Bogotá), what to do for the holiday weekend when everything is closed (suffer on a bus), and gets me to the mountains around Mérida in a period of better weather. Continue with my adventures in Venezuela. Arturo left for Quito. Bon voyage. It was good while it lasted but now I am back to traveling solo like usual. I can't believe how quickly time passed. I need up update his popular page. 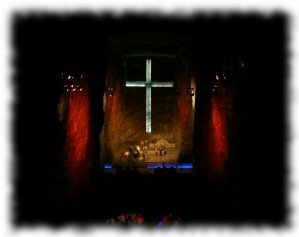 The Catedral de Sal is a 1½ hour journey north of the capital in (or under) Zipaquirá. Arthur and I did this as a day trip. There is a mountain of salt-veined rock that has been extensively mined since the Muisca first discovered what it was. The cathedral is huge - able to accomodate 8400 people. It measures 75m long and 18m high without including the stations of the cross walk and naves. The tour lasted about an hour and was surprisingly interesting. I have some good photos but this is one place I probably won't bother to put online unless I get requests. The bus ride to Bogotá was 19 hours and we got there an hour early. We settled back into the Platypus. Everybody loves that hostel and the owner is a wealth of information. I recommend it the next time you travel here. The two of us took the rail car up Monteserrate to the Sanctuary of the Fallen Christ which is on a steep hill overlooking our neighborhood. It wasn't all that interesting but from up there we had a good view of the city's sprawl. We took the cable car back down and made plans to visit the Cathedral of Salt the following day. As you know I meet a tremendous amount of interesting people. One of them is Jason Howe. He is a photojournalist that has spent a lot of time in Colombia with both the paramilitaries and guerrillas and has the photos to prove it. He is back in the country after about a year photographing Iraq. As you can imagine he has a lot of interesting tales and I would like to plug his website, Conflict Pics. 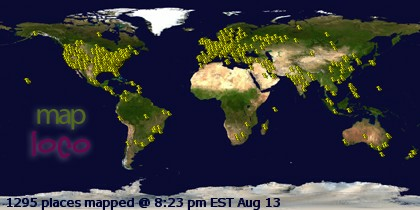 Go visit. I told him you would. My first Colombian ascent! 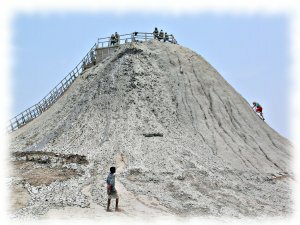 The Mud Volcano rises a breathtaking 15 meters above it's surroundings on the coast between Cartegena and Santa Marta. At an estimated 30 meters above sea level it is the country's highest mud volcano. As a climber it was a must do. After acclimatizing by climbing the "Via Madera", I attempted to open a new route on its muddy and treacherous seaward face. 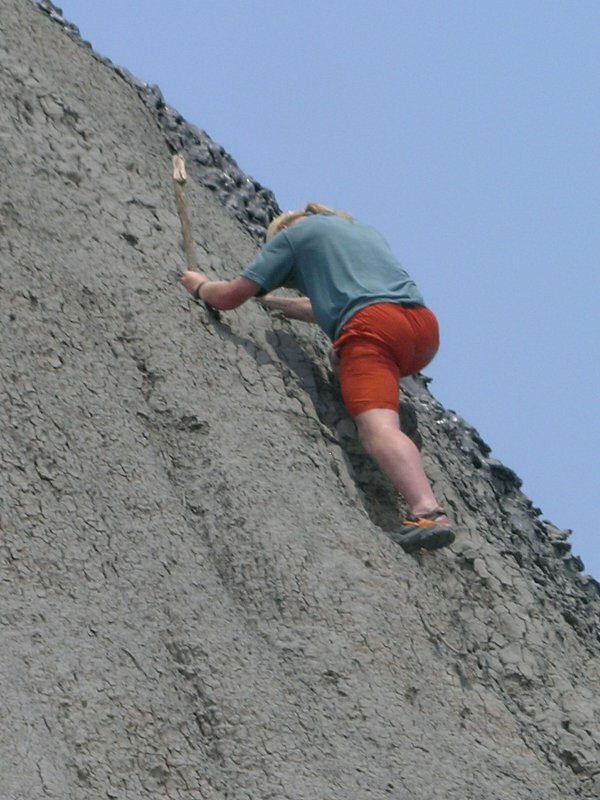 With a sharp stick and a butterfly knife I attacked the technical dirt and successfully climbed half the route before my photographer reported "I think they want you to come down from there". Are you wondering what a mud volcano is? Well in this case, below the ground organic matter is rotting. The resulting gases causes mud to splatter from a hole in the ground. Over years this splattering mud has built up into an impressive pile of dirt. The crater is filled with mud and it is advertised as a medicinal mud bath. I wouldn't know from firsthand experience since I was not about to jump in with the the idiots. Here the stinky Frenchman finally took a bath. Islas del Rosario is a very popular tour that leaves daily from Cartagena. Because this was the holiday week of Semana Santa a mountain of Colombians arrived in the city on vacation. Neither Arthur or I really cared for this trip. It was a tourist trap. Islas del Rosario was lame. The small coral islands were covered in houses. The aquarium was good but not a reason to make the trip out there. The best thing was the boat ride back from the islands getting soaked while rocketing over the swells. Playa Blanca may be a nice beach and I have fond memories of the two lady massage but everybody was surrounded by touts hawking all sorts of crap jewelry or oysters. You couldn't even relax. Then at the restored fort of Bocachica where we were supposed to eat, we discovered that for some reasons our names weren't on the lunch list even though we prepaid. So Arthur and I didn't eat. He went to the dock in disgust and I took some pictures of the fort. Our recommendation is not to bother with this trip. Now my favorite colonial city, Cartagena de Indias lives up to its billing. It was Spain's main port in South America and a giant target for pirates. Two hundrend or so years of building ringed it with lots of fortifications that have been nicely restored. The historic center of the walled town is also in very good condition. It is the nicest example of Spanish colonial that I have ever seen. The modern town which we never visited is also impressive if the skyline is any indicator. Our plans were to use Cartagena as a base. Essentially we spent one day exploring the museums and city and two days of daytripping outside with the nights partying (rumba in the local vernacular) in the city. Or rather trying to party. We had a disturbing amount of trouble actually getting inside some of the clubs. So now that I have my photos uploaded be sure to give the city a virtual tour. The castle featured at the end is Castillo de San Felipe. It guarded the overland approach to the walled city. 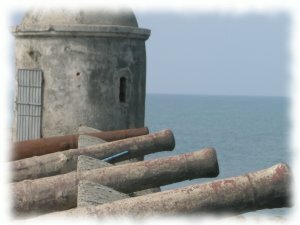 The picture on this page is part of the walled city's main defenses overlooking the sea. This is supposed to be the country's most popular national park and I can believe it. I'm not really a beach person but it is sometimes a nice change and the ruins of another Tayrona city are located there. The first day was a 40 minute hike in to Arrecifes where we rented a hammock for the night and partied on some rocks until late with Oscar and the thundering surf. On day two we moved base to Cabo which was an even nicer beach but a bit crowded with other travelers and various biting insects that made me regret forgetting my repellant. That is where the picture is from. 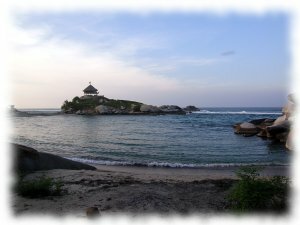 An hour inland are the ruins of Pueblito (possibly known as Chairama to the Tayrona) await hikers. This was the most important coastal city as is served as a focal point for all the smaller fishing villages along the coast. It was bigger than I expected and although less impressive than Ciudad Perdida it had some stonework on the terraces not found there and an underground aqueduct. As in the Lost City it was not completely uncovered. 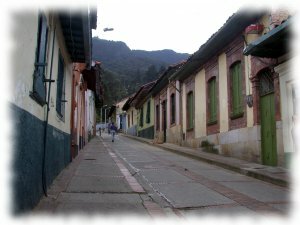 Nearby Santa Marta is the town of Taganga. It is a small fishing community known for its dive centers and relaxing atmosphere. We spent some enjoyable days here. As usual I was prowling for seafood. Although I like fried fish I don't think it ever occurred to them that there are other ways to prepare it. We stayed at the very nice Casa de Felipe, a French-Colombian run hostel, where we saw many various people we knew from Bogotá, Ciudad Perdida, and Santa Marta. Most people are all travelling the same circuit. Ester and Miriam were here. 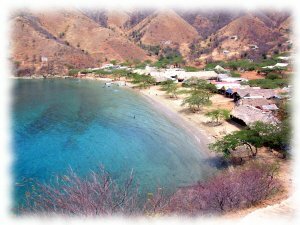 Taganga is nice enough but there isn't too terribly much to do if you are not diving. Everybody hiked around a bit, visited Playa Grande a beach close by, ate fish, swam, et cetera. We left almost everything here and headed back through Santa Marta to Parque Nacional Tayrona to start three more days on the beach. 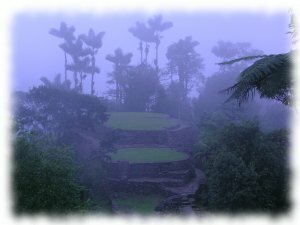 Colombia's Lost City and most important precolombian site. This was as good a six day trek as I have ever had. Happily I took the time to journal the adventure and of course over photographed the experience as you have come to expect. The details are uploaded. (day 1, day 2, day 3, day 4, day 5, day 6) Journal and photos from the second half of the trip are still forthcoming. This is a famous outting although it hasn't been as popular recently due to an entire group being kidnapped from the ruins by guerrillas in 2003. That worked to our advantage as there were not a ton of people and we could bargan down the set price a little. The short story is that the sweaty trip was three days to the ruins, one day there, and two days back through coastal jungle (or cloud forest depending on who you ask) on Colombia's Caribbean coast. The only bad thing was that most groups have the opportunity to visit a cocaine laboratory (this is all marihuana and cocaine territory so don't wander too far off the trail!) but maybe they had the day off and the guy never came around to offer the bonus tour. We have spoken with a number of people who seen the lab and it sounded like a great way to spend 20 thousand pesos (a bit less than USD $10). In case you are wondering my sources tell me that a gram of cocaine can usually be had for around USD $5 - $10. Yes, it is often less than a bottle of rum. About one dollar buys a gigantic bag of weed. Unless you take the Lost City tour, then a generous bag is included in the tour price. Only in Colombia! Arthur Labonne is here. We visited the colonial center and took it easy. Sunday I accrued about 13 hours of sleep since that time Saturday. Well rested and clean, I was ready to explore the city. Unfortunately it was the last Sunday of the month, and the museums have free admission (thus crowded). Really all I ended up doing was exploring the neighborhood and a few bookstores. I had wanted to visit the historic center but that didn't happen thanks to a wrong turn and a dearth of street signs. I decided to wait and visit the museos the next day. I had planned to visit two of the most important yesterday but before I knew it, the hour was too late. Oh let me tell you about Sunday's new experience. In the morning, a guy approached on the street and pulled out a rolled up piece of paper out of his pocket. I was sure he was selling drugs but no, instead he wanted to sell something else Colombia is famous for: emeralds. I've never been approached on the street to buy gemstones before. Obviously I wasn't interested. They were probably glass anyway. Come Monday I was ready to see those museums and perhaps take the gondola up to Monteserrat on the hill near where I am staying. At the last moment I checked my tourist guide. All museums are closed on Mondays! Damn. Okay, Centro Histórico then. This time I found it with no problem. Highlights included Plaza Bolivar (the main government square) featuring the Palace of Justice, Cathedral, National Capital building, and Mayor's building, then I moved on to view (from the outsides) the Santa Clara church, old Astronomical Observatory, lots of soldiers, Casa de Nariño (where I was chased off by a guard for lingering), and peaked inside the church of San Augustín, before returning via the Casa de Moneda (mint? ), and various side streets. I got a real good look at the city today. And this was the first weekday in town. The streets were filled with students, businessmen, and government officials. Back in my neighborhood I walked through the vendors around the small Plaza of our Lady of the Rosary, Plaza Rosario, and Parque Periodistas. I actually brought one of my cameras so I have a small gallery of photos for you to enjoy. Tuesday morning I went to the renown Gold Museum, Museo de Oro, and later to the Archeological Museum. Both were good but I had been expecting more. And because they are on opposite ends of the historical center I walked through that again. The Gold Museum is located only a 5 minute walk from where I am staying. It was two floors of nothing but gold artifacts from various precolombian cultures in what is now Colombia. Some of them were from the Tayrona which were the advanced people that built Cuidad Perdida which Arthur and I are going to trek to near the coast. The latter museum had a couple rooms of colonial artefacts but mostly showcased the precolombian ceramic history. It was good to see both museums the same day. The flight from Quito was only an hour. Taking the bus would have been around 50 hours I think. I had to be at the airport at 04.30 though. That was way too early especially considering for the third night in a row I hadn't gotten much sleep. For now I am staying at Hotel Platypus. I don't know why they chose that name. 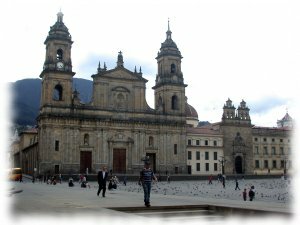 It is located in Bogotá's Candelaria district. 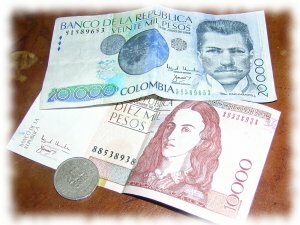 For my first day I changed money (the exchange rate is about $1 = 2,100+ pesos), got my hostel, and checked out the neighborhood. I fell asleep around 17.30 that afternoon. I'm able to connect the laptop here at the Platypus so I'll have good website access while in town. After that, who knows? In this moment I'm not sure what my schedule is. Arthur is supposed to meet me on the 2nd or possibly the 3rd. That doesn't give me a whole lot of time to go far. I'll probably just stay within a few hours of the capital until he arrives and we head to the coast.